1. Preheat the oven to 200C (fan 180C), 400F, Gas Mark 6. 2. Unroll the pastry sheet and leaving it on its parchment wrapping paper, slide it onto a large baking sheet. 3. Using a plate or pan lid as a template, cut out two 7 inch circles from the pastry. Brush the boarder with a little egg yolk, ensuring it doesn’t drip down the sides. Neaten the long side trimmings into strips and using a rolling pin, roll them a little longer so as to fit all around the edge of each tart. Place them on each one to stick. Score a pattern on this edging with a sharp knife and brush with egg yolk. Prick all over the inside of each disc with a fork. Bake for 10 minutes. 4. Meanwhile, mix the mascarpone, Gruyere and shallot with the remaining egg yolks. Season lightly and set aside. 5. Slice the carrot and courgette into long, thin strips, using a mandolin, vegetable peeler, or a sharp knife. Toss in the oil and set aside. 6. Once crisp, lightly golden and puffed up, remove the pastry from the oven. Reduce the oven temperature to 180C (fan 160C), 350F, Gas Mark 4. Flatten the pastry centres with the back of a spoon and divide the cheese mixture evenly between them, spreading it smooth. 7. 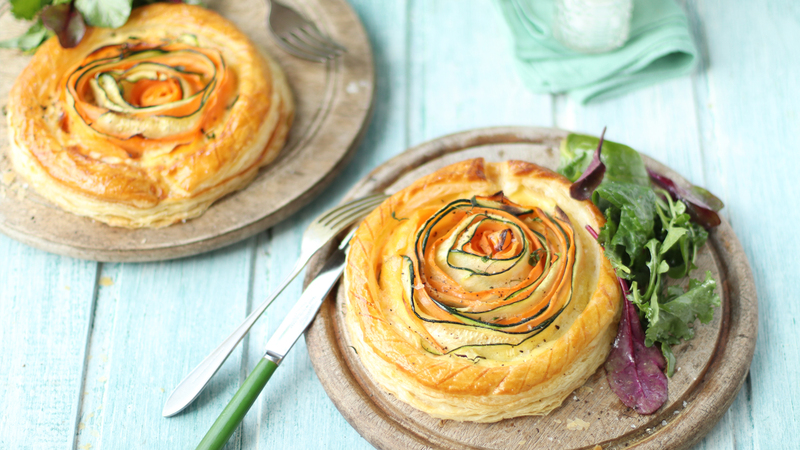 Roll a strip of carrot into a tight circle and place in the center of the tart. Roll a courgette strip around this and continue wrapping alternative vegetable slices in concentric circles outwards, until the tart is full. Sprinkle with salt, pepper, and thyme. Bake 20-25 minutes. 8. Make the dressing by whisking the oil, vinegar, mustard and honey together in a large bowl until thickened. Season to taste. Toss the salad leaves in the dressing just before serving. 9. Once cooked, the pastry should be golden and the vegetables tender. Remove from the oven and slide onto serving boards or plates. Serve at once with the dressed salad. Use basil or sun-dried tomato pesto in the base instead of mascarpone mixture if preferred.